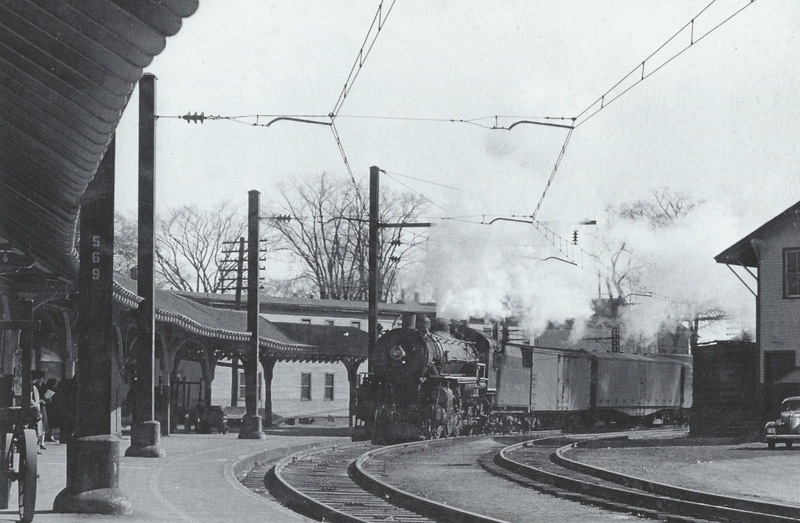 The substantial yellow brick passenger station at Danbury Connecticut was opened in 1903. 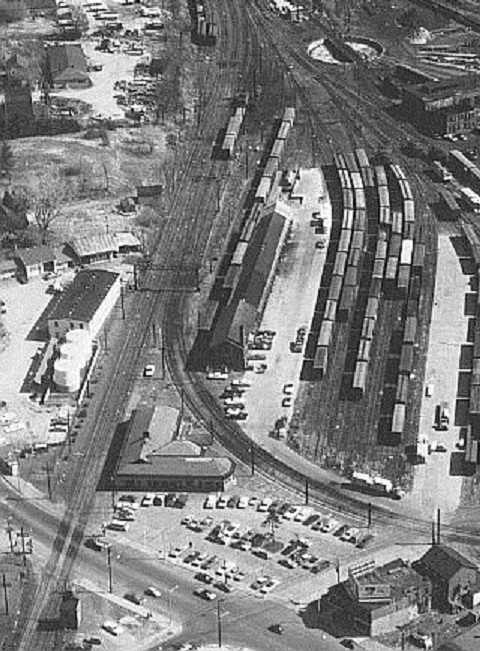 This union station replacing the redundant wood frame stations of the Housatonic RR and the New York & New England RR after those physically separated railroads at downtown Danbury were connected by a loop track once merged into the New Haven system. 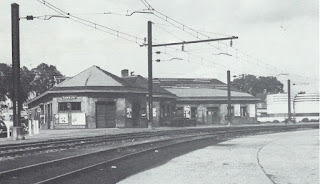 The trackside photo below of the station was taken not long after the building opened in 1903. The station was still well used during the mid 1950's era of the layout with four thru New York/Pittsfield trains and the originating and terminating commuter trains to and returning from New York City daily. 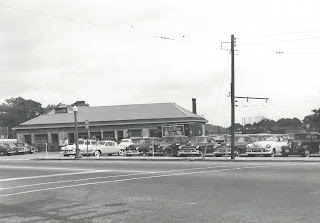 The station appearance changed in the early 50's by the removal of the platform canopy seen in the photo above. Photos of the station in the mid 50's after the removal of the platform canopy without a train in front of the building are very hard to find. 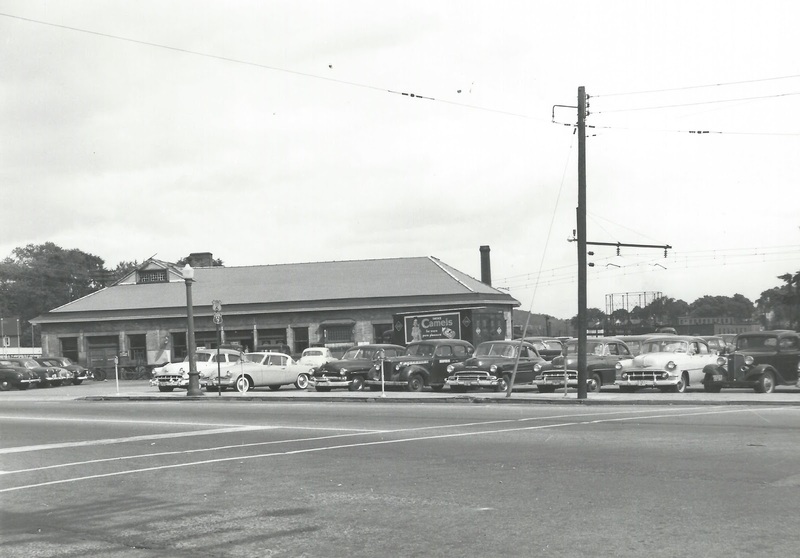 Fortunately New Haven Railroad photographer Charles B. Gunn took the station photos below unobstructed by any equipment, the occasion of these photos was most likely to record the installation of new roofing shingles in 1956. 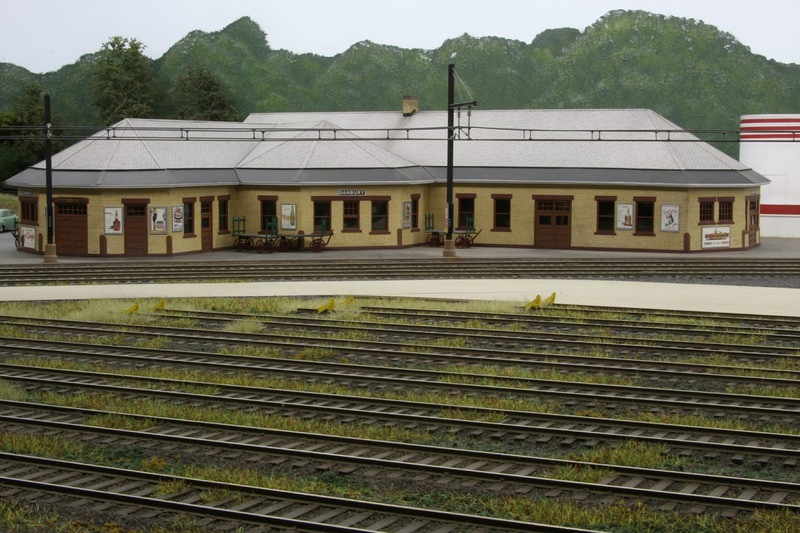 Although not modeled on the layout the below photo shows the street side of the station. The restored station in 2016 from track side. As mentioned before the loop track connected two separate railroads that served Danbury, this connecting track creating a shorter direct route between New York City and Pittsfield MA for the New Haven RR. A new union station was built on this loop track to serve the traveling public. The aerial photo below shows this loop track in its entirety. The layout of the tracks and yard at Danbury has a model railroad track plan like persona in this photo. 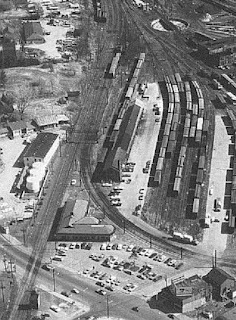 This photo taken from the station platform in the 1940's shows the broad radius of the loop tracks that would be required to duplicate in scale. 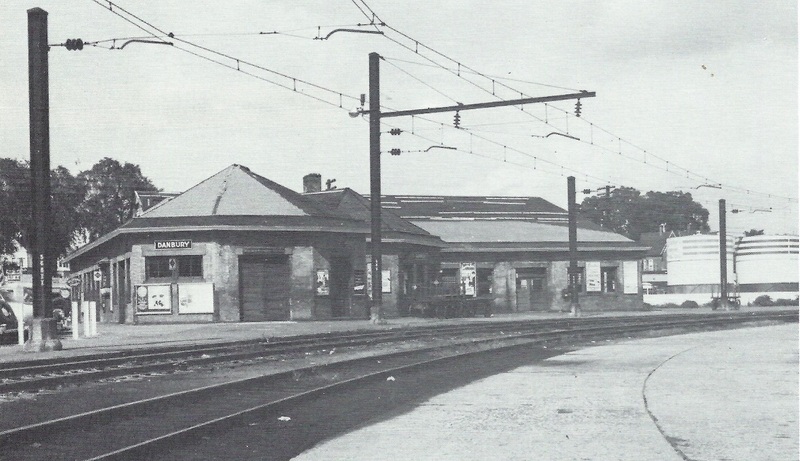 The design of the station building must have been built to accommodate the radius or degree of the loop track that was put in place before the construction of the station. To accurately model the station building and the loop track together, the radius of the modeled loop track must be the same as the prototype for it to look correct in relation to a scale model of the station. There is not enough width in the layout room to model the entire loop accurately. When designing the layout only a portion of the loop track and encompassed yard could be included. The aerial photo below shows about 1/3 of the loop track, this is the portion that is being modeled on the layout. The photo below taken early in the layout construction shows how this 1/3 of the loop track pictured above is modeled within the available layout space. The two car train and motor are located where the station building will be and sit on the roadbed for the loop track. In this photo the north bound train would have just emerged from the off scene helix that connects from/to the staging tracks below that represent the New York City area (where the engine and caboose are). Along the wall the roadbed is in place for the Maybrook line that heads west from Danbury at the junction point with the loop track. The Maybrook line will also enter this helix for several turns up to the Maybrook classification yard staging above the Danbury modeled portion of the layout. Part 2 will discuss building the station model seen below with some construction photos.